I’m feeling awfully pleased with myself. Today somebody shared a post on FB by Ieatishootipost on Bergedil and I immediately had a craving. 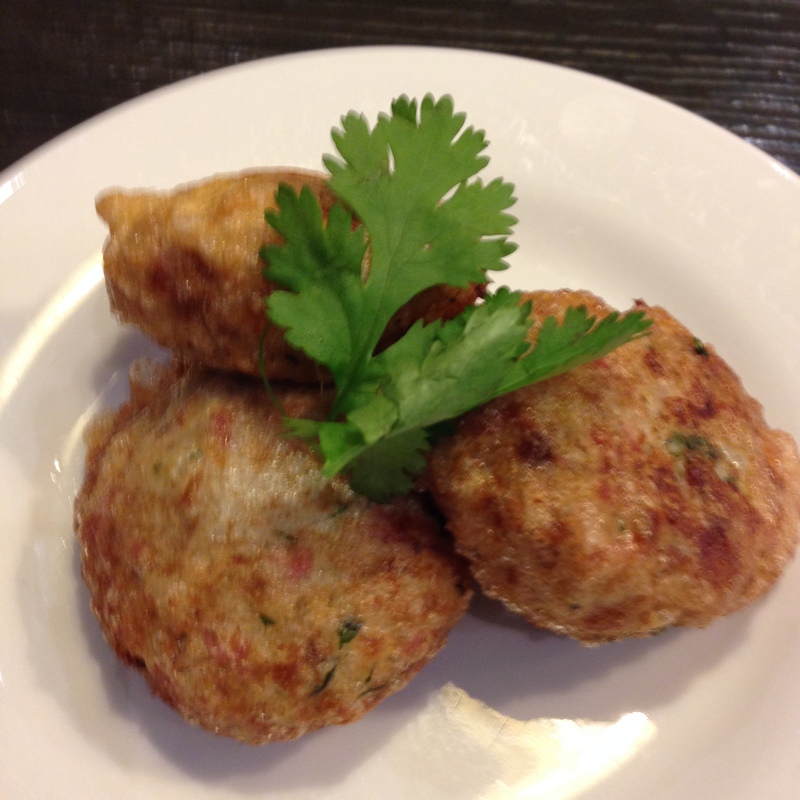 Bergedil is a Malay potato patty that is made from mashed potatoes, fried shallots, coriander and/or spring onions, dipped in egg and fried. It is often eaten as an accompaniment to other Malay dishes like mee soto, but is often eaten on its own. 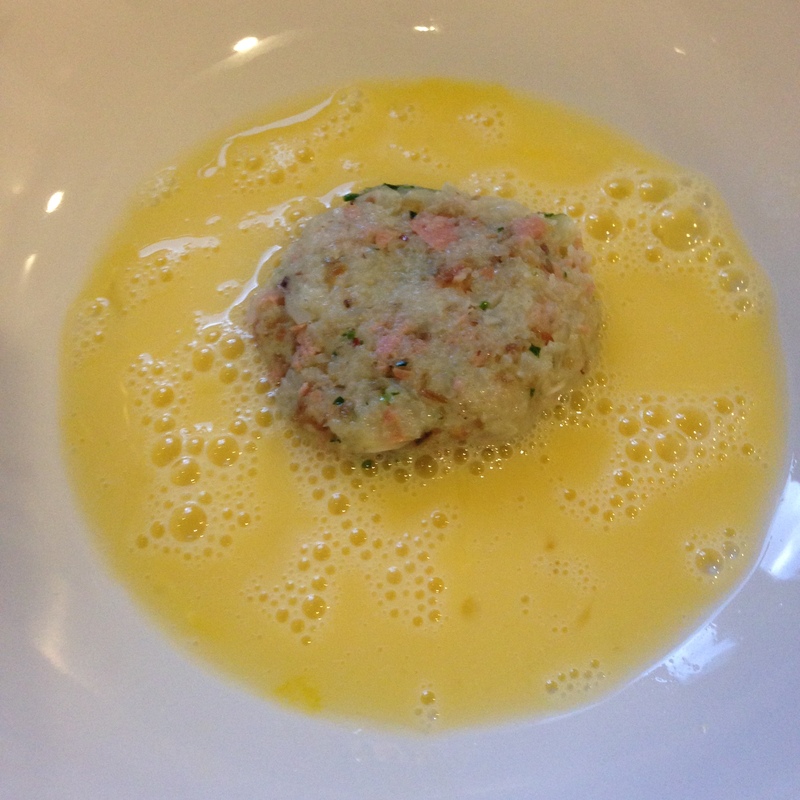 It is a terribly simple dish but perhaps the simpler the dish, the more important it is to execute it properly. Turning this into a low carb version is not that difficult. 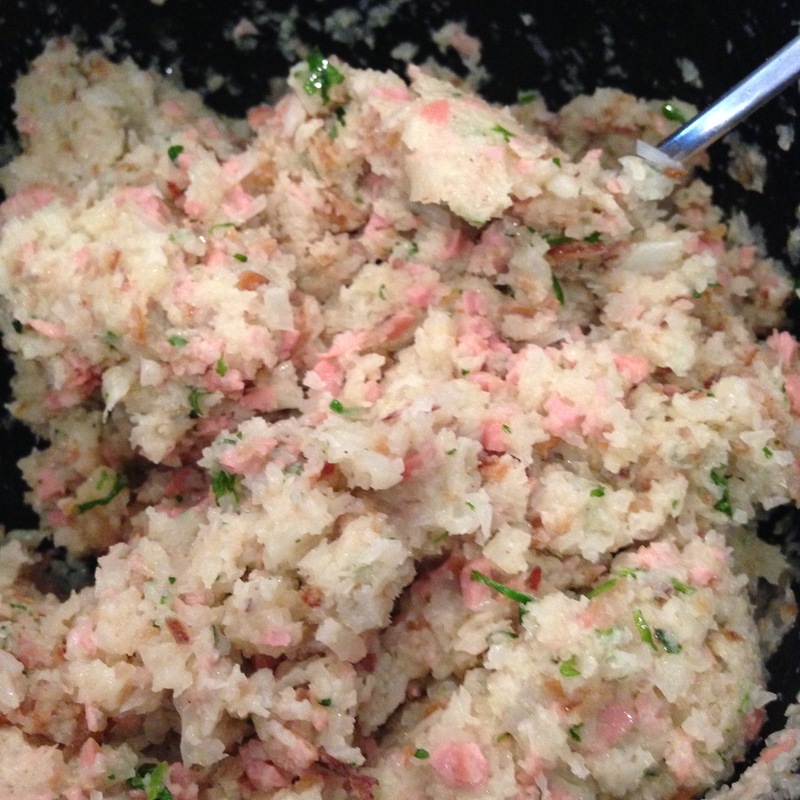 Cauliflower can be very similar to potato when mashed and is an excellent low carb alternative. Potato is about 15 g carbs per 100 g whereas cauliflower is only 1.8 g carbs per 100 g. Excellent pay off and many of my friends who have tasted my cauliflower mash agree that it tastes as good, if not better than potato mash. Potato patties are universal across all cultures. Even the Japanese have a potato croquette (korokke), the French have their croquette and the Dutch have kroket. 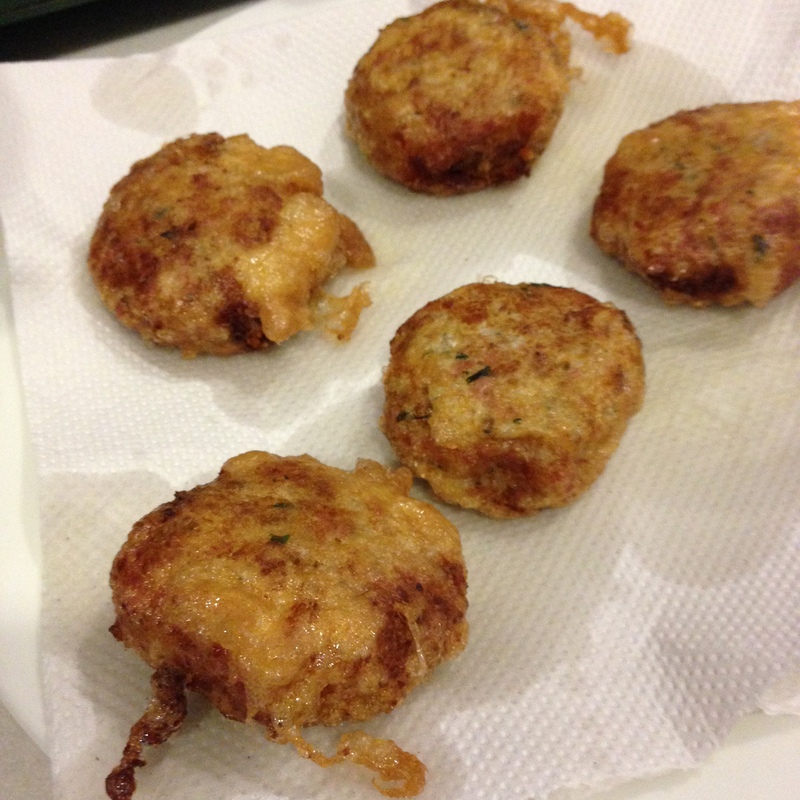 Unlike these croquettes, however, the Malay bergedil is not breaded but is simply dipped in beaten egg and fried. This gives a really warm, rich and slighly crispy crust and a superlatively tender patty inside. The only tricky thing about using cauliflower is to make sure that the cauliflower is not overcooked or wet as this can make the textures too soft to make into patties. As a first try, I think it was fairly successful and the hubs and kid #2 both approve (kid #1 is out and missing…normal teenage behaviour during the holidays…). This recipe is a keeper :-). 2. 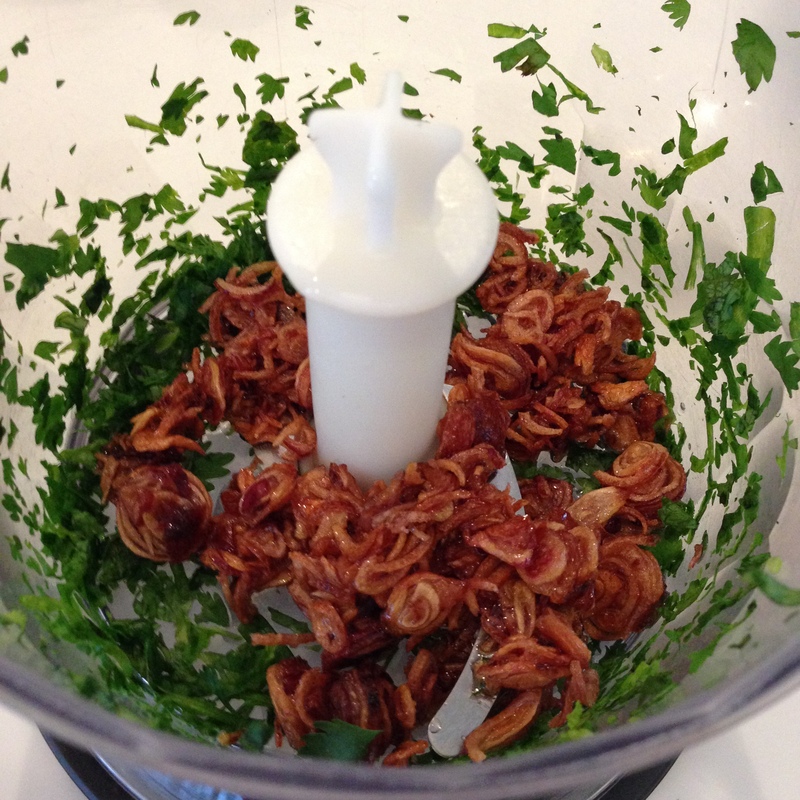 Using a food processor, chop the coriander and spring onions. 3. Add the spring onions and cauliflower and pulse till fine. Add the salt and spices and minced meat and mix well. 4. Shape the patties in hand, approximately half a palm in size. Dip into the beaten egg to coat. 5. Heat up oil in a wok or a deep saucepan over medium heat. Carefully slide the egg-coated patty into the oil. After approximately 1 min, gently flip over the patty to ensure even cooking. 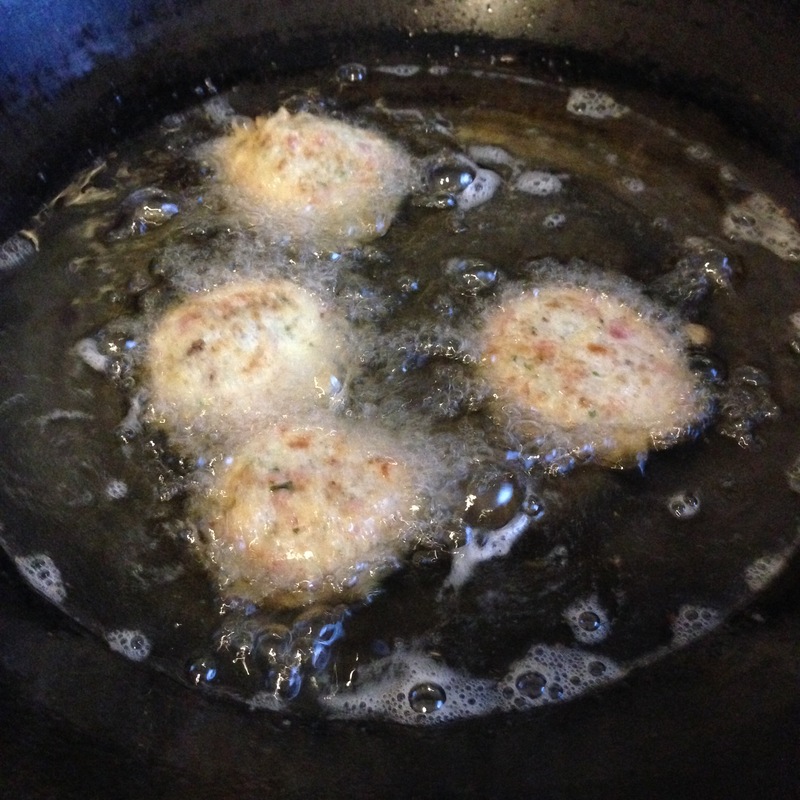 Fry the bergedil till the skin looks brownish and slightly crusty. 6. Drain the bergedil patty on a plate lined with kitchen tissue or towel. 7. Serve hot with a generous serving of cut red/green chilli. Thanks! googled low carb Bergedil and found your blog! I’m singaporean eating lchf too!